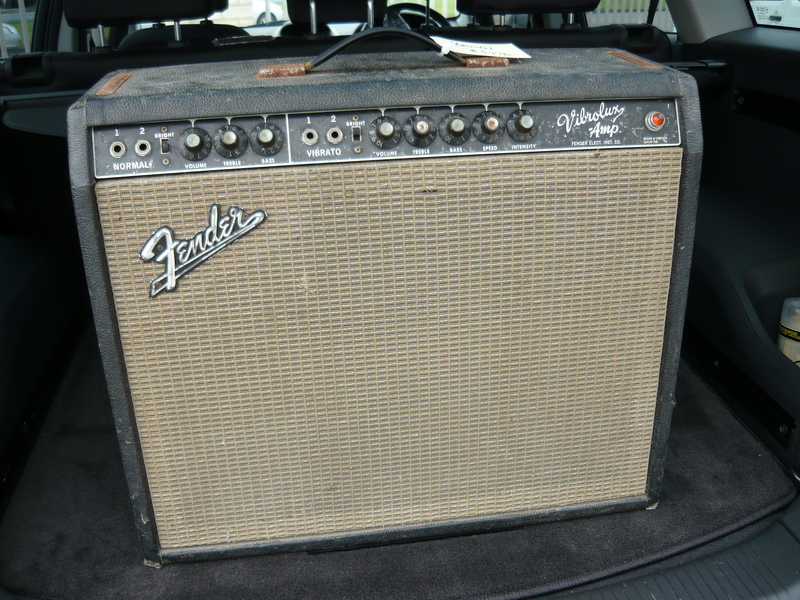 Here is another rarity, send to us for a complete overhaul by Bondi Intermusic – the Fender Blackface AA763 Vibrolux amplifier. Manufactured in 1963 ?? This model features normal & vibrato channels (it’s actually tremolo), with a valve (tube) complement of 3 x 12AX7/7025/ECC83, 1 x 12AT7/ECC81, a pair of 6L6GC output valves, plus a GZ34/5AR4 rectifier. The speaker in this combo does not appear to be original, and has no apparent identifying codes/numbers, so is a bit of a mystery. 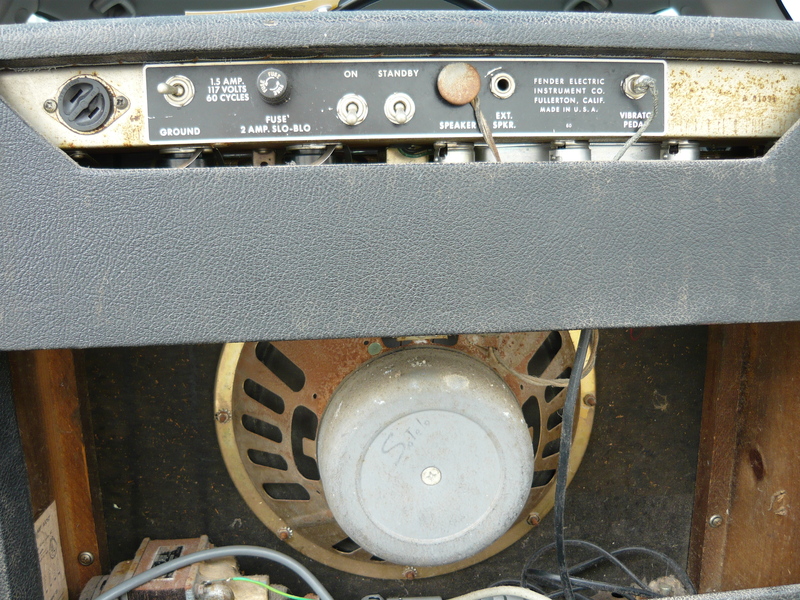 The amp was in a filthy state as delivered, plus the chassis and front panel have a corrosion problem, so the amp has probably been stored somewhere damp for years on end. This amp has the potential to sound fabulous with a good speaker unit on board, and at 40 watts is ideal for today’s lounge gigs. After a bit of a clean up, the first and most significant problems to be resolved are all about electrical safety ! 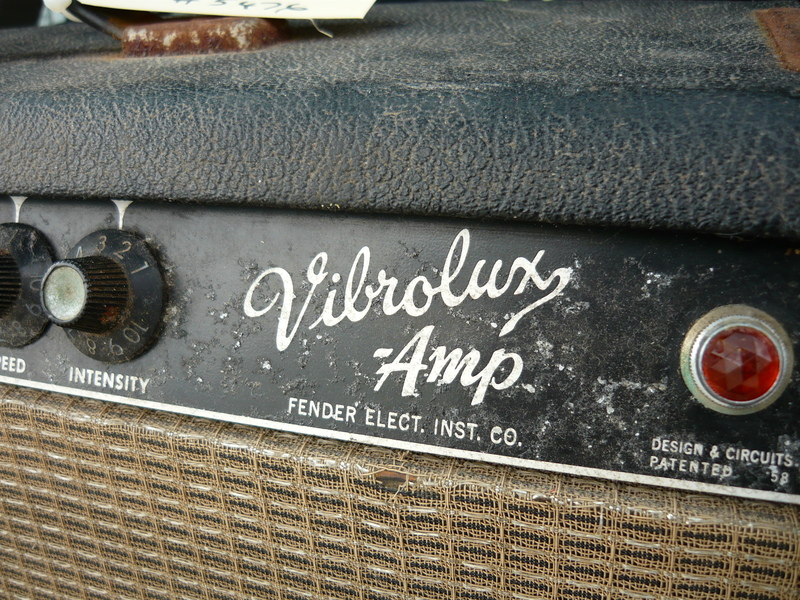 This amp was brought into the land of Australia many years back, with a chassis wired for the USA mains voltage only. Somebody mounted a stepdown transformer in the bottom of the cabinet and wired up a pretty dodgy earth connection to this transformer – the whole arrangement would never pass the Workcover NSW electrical safety inspection, and quite frankly was an accident waiting to happen. Our recommendation to the customer (Mark), via Bondi Intermusic, was that we remove both the stepdown and the original USA power transformers, and source a reproduction Vibrolux power transformer with an “export” primary, ie the primary winding has several wiring options for global power. This recommendation was accepted, and we installed a transformer made by Heyboer (USA), supplied by Mojo Musical Supply Co. A new 240V 3-core flex & 3-pin plug was also installed and the mains power wiring within the amp chassis rewired to an acceptable standard. Once all the above was completed and tested, we could get on with tonal improvements. 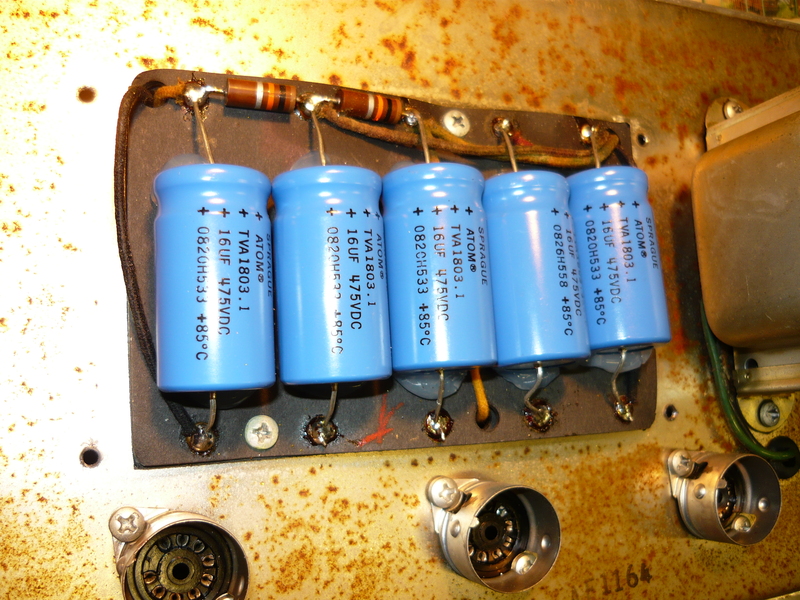 We replaced the five cathode bypass capacitors with Sprague 25uf/25V units, as per the photo. This will help bring the 12AX7 gain stages back to life. 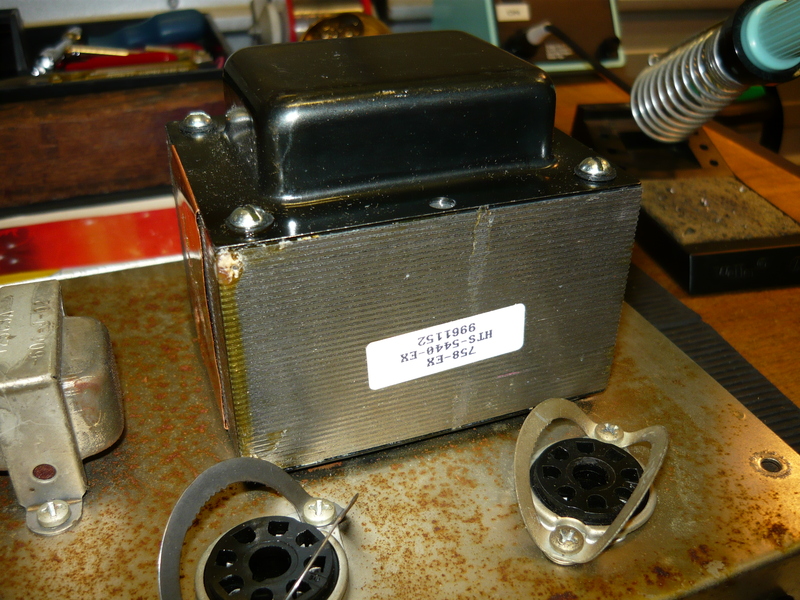 Next, we replaced the five ageing power supply capacitors with Sprague 16uf/475V units, as per the original spec, the first pair are paralleled giving 32uf for the main reservoir capacitor, which is well within spec for a GZ34 rectifier. These five caps are bedded down in some silicone (neutral cure), so the axial leads will not be stressed as the amp is bumped around, or loaded in & out of motor vehicles, etc (see photos). 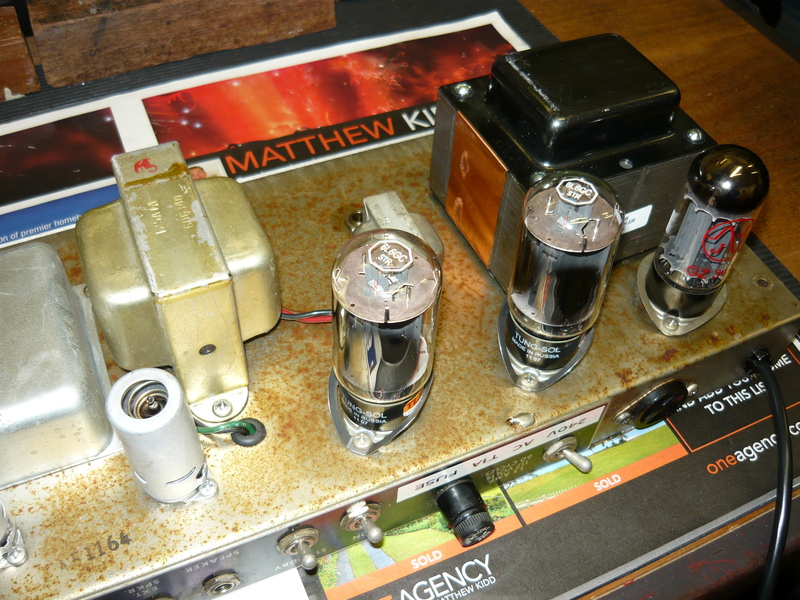 All the amp’s pots (potentiometers) were cleaned/lubricated with Caig Faderlube, and all the jacks cleaned with DeOxit. It’s amazing that in an amp that’s nearly 50 years old – after this basic level of servicing, all the original pots & jacks work just fine ! If only they made stuff this well nowadays. Someone not known to us has previously replaced all the 100K ohms anode resistors – no doubt they had become noisy. Most importantly, the bias voltage supply was repaired, with a new capacitor and the original resistor values restored. Now, we can install some new valves, as appropriate, and have a listen to this amp. A couple of the valves tested fine, so we ended up installing a new 12AX7, a 12AT7, a JJ GZ34/5AR4 rectifier, and for the first time we installed a matched pair of the Tung Sol reissue 6L6GC output valves, which have received favourable reviews in the guitar media. We rebiased the 6L6’s and carried out a power output test. The end result was perfect – 40 watts into 8 ohms at the onset of clipping. Well, there we have it ! This wasn’t an inexpensive repair by any definition. Over 4 hours labour plus high material costs, but it will be worth it once Mark is cashed up enough to load a good quality guitar speaker into this amp – he will be able to enjoy the full tonality of this fine early 60’s amp. Hope you enjoyed the blog, please check in with us again. ps> we connected the amp up to our current workshop reference speaker – the Warehouse (WGS) ET-65, ie their clone of the famous 65 watt Celestion from 30 years ago. This speaker is like a high powered “Greenback”, with more bottom end (for want of a better description). Well, the Vibrolux really came alive with this speaker – a LOT more volume, not to mention more bottom end, more tone, more everything. Recommended ! ps> Mark did install a WGS ET-65 in this amp as per our recommendation, and in addition back in 2015 ordered from us a matching 1×15 cab loaded with the Eminence 15″ guitar speaker which sounds amazing with this amp – Mark is a surfer from Maroubra NSW, so all he needs now is a reverb pedal and he is fully equipped for some surf instrumentals. 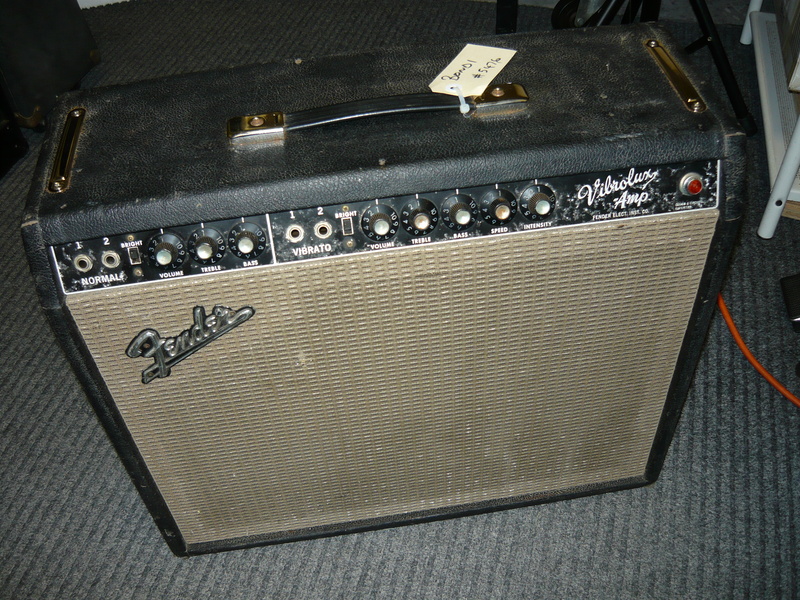 This entry was posted on April 23, 2012 at 1:32 pm and is filed under Amp Repair, Amps. You can follow any responses to this entry through the RSS 2.0 feed. You can leave a response, or trackback from your own site. I had my ’66 Bandmaster (AB763) with tremolo serviced by someone else after it had been stuffed around by a so-called ‘amp tech’ at Annandale who removed the ‘death cap’ and fitted a 3 pronged pwr cord for the step down trnsfrmr. 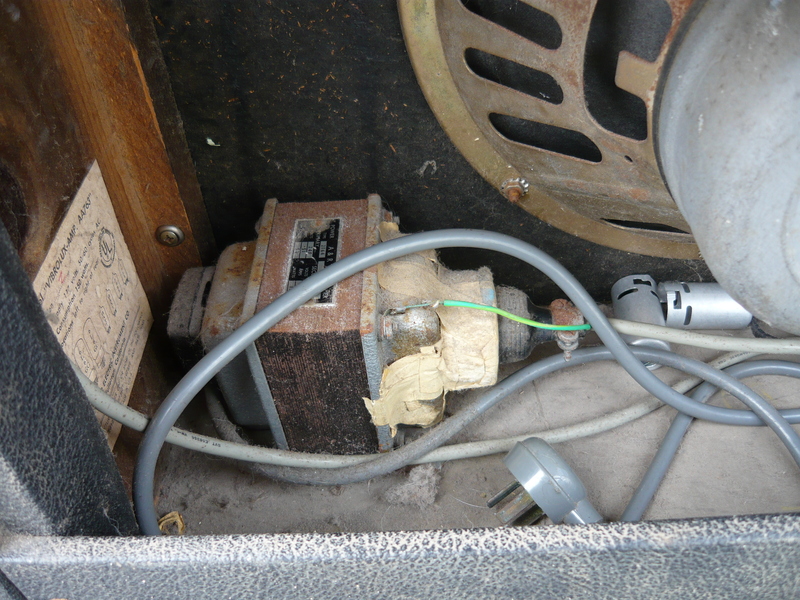 In your (previous mods)article on the ’63 Vibrolux AB763(above, owner Mark), you say replaced cathode bypass caps with 5xSprague 25uf/25v units, and power supply caps with Sprague 16uf/475v as per original spec. – 6x Jamicon 47uf/350v in the open elongated section on the other side of the amp ‘board’ (i opened it up and made note when retrieved). – 2x Astron MM-20-525WVDC…. 6538. – 1x Astron MM-20-550WVDC…. 6504. 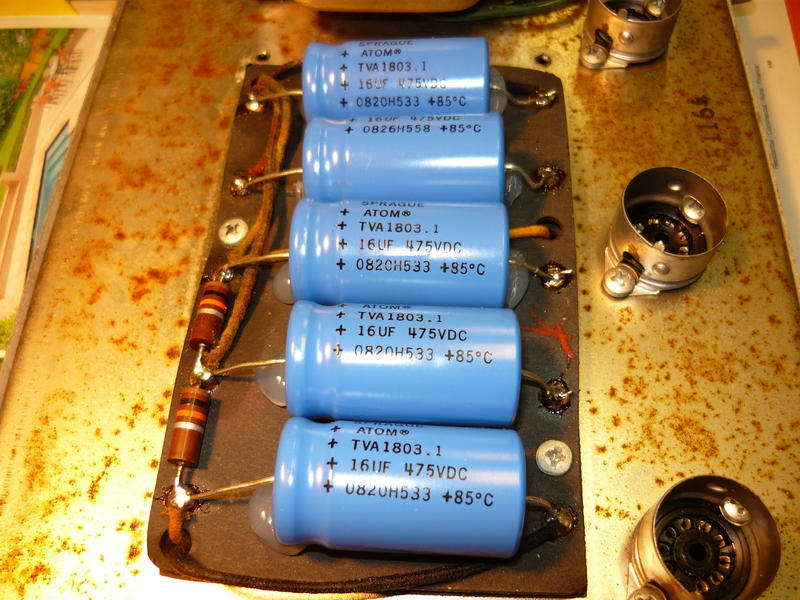 – 2x Mallory 70MFD 350VDC…..
– 2X Mallory 25-25MFD 25 VDC. – 1X Mallory 50MFD 50 VDC. – 1x Mallory 25MFD 25VDC. – and a couple of resistors. and you mentioned tested at 40W into 8ohms, i had to shop around to find a 4ohm speaker cab. 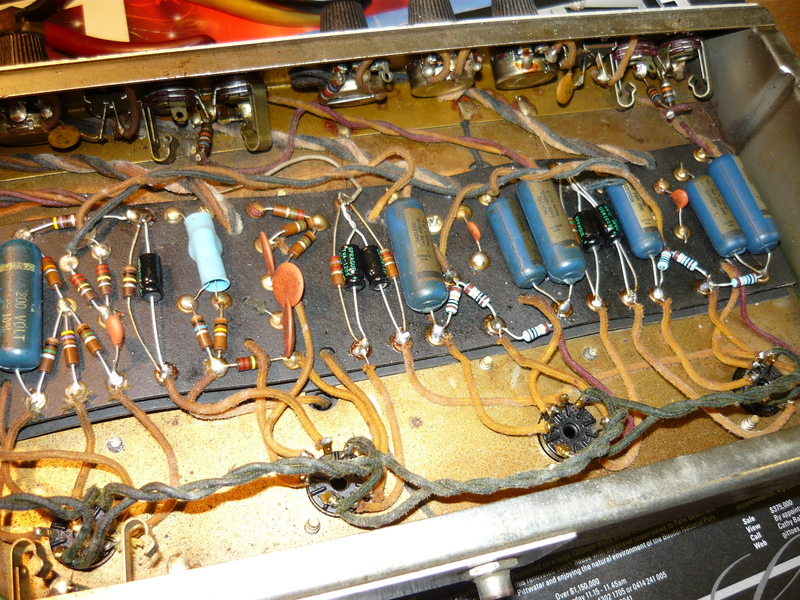 hello ’66 Bandmaster: yes the capacitor specs did change from early 60’s to later 60’s & models intended for a single speaker had a fixed output impedance of 8 ohms, while models intended for a pair of speakers had a fixed output impedance of 4 ohms.